and I don't think these major 'European' brands are worth as much as twice the price. Still my best experience is with the Michelins on the Murena. Also the Pilot primacy V speed on the front did very well and much better as the Michelin E3A. It's a pity they were 195x15x55, to big for my purpose. It was my best experience on the front till now. My experience with Chinese tyre brands is that they have exceptional bad performance in the wet. I wouldn't put them on a mid-engined rear-wheel driven car like a Murena. If you are a self-murderer, than go for Chinese tires. That's why I dumped them after 1 day trial. It was my worse experience on the Murena. Today I drove a bit around with my new set-up. First tests are very promising. Well to put another view on this, I'm afraid I would *never* fit Michelins after my experience with them. The main problem is that Michelins have a reputation for long tyre life. They get this by being 'harder' but hard tyres don't grip as well, and I value MY life more than tyre life. I always go for the softest tyre I can get with good wet grip. When I had Michelins fitted they gripped well - up to a point - and then let go with no warning! I was lucky to get away with the spin as there was nothing else on the road. I drive my car hard and want the best out of it. I found softer tyres were much more progressive and I could feel the approaching breakaway and control it. On the Murena the front is so light relatively that even with soft tyres and great grip I get 30,000 + miles anyway so that is fine as far as I'm concerned. Rears last less owing to the extra weight and the power going down through them, but again I don't mind as long as I get the best grip. And I always check my tyres and pressures regularly since without the right pressures, and tread depth, the car will be unsafe. Most people drive on their tyres until they are very close to the legal tread limit (1.6mm in the U.K.) but again I do not. I change them much earlier. To me Michelins may be fine if you don't drive the car hard and near their limit, but even then any tyre that breaks away suddenly with no warning is a liability since you just don't know when it may happen. I'm with Roy on this. I would never drive a tire with hard rubber compound. That is why I will stay far away from the new ECO rated tires that are being mandated by the EU. ECO is apparently a rating that should signify longer tire life, less rolling resistance and better fuel ecconomy. But therefore POOR traction, especially on wet roads. I had a tough time finding good tires for the original alloys and ended, as i wrote earlier, with Continental PremiumContact-2 tires. They are very comfortable and after some getting used to, actually handle very well. The only thing to watch out for is not to make quick adjustments while going through a turn at speed. The tire walls are a bit soft for that. A couple of months after I got mine through www.daekonline.dk, they started carrying the 195/60R14 in a V rated tire. I would really like to try the difference to see if the handling improves a lot. The 185/60R14 does not come in V rated. ... The 185/60R14 does not come in V rated. Jon, I seriously recommend 185/55 x 14 fronts - they are so much better than the original 60 profile. The sidewall being shorter is stiffer and gives better response, turn in, and often this size has better patterns or ratings. For example when I bought my Uniroyal 550's the 185/60 x 14 had only one main centre channel but the 185/55 x 14 had two just, like the rear 195/60 x14... and it was rated better in the wet! 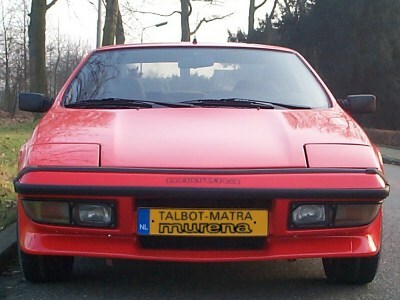 I have used the 55 profile for years on the front of the Murena as they are so much better and would not go back now. The improvement is out of proportion to the small drop in profile, and I'm sure you would find them better. You might find some tyre brands will do something 'interesting' in a 55 profile whilst there is nothing good available in a 60 profile. The P700Z I used to use was not available in the 185/60 x 14 but was available in the 185/55 x 14 size. Jon, I seriously recommend 185/55 x 14 fronts. Extra advantage is that it lowers the car a bit on the front. I am not looking for a circuit or track-day set up. I am looking for good road handling in combination with some comfort. That are total other demands then what you are looking for. Our goals are different, so is our opinion on this. Yes that is another good point about this profile. Our opinions may differ, but I do not use my car on the circuit. I drive it hard and fast on the public roads, when the roads are appropriately empty. :-) I tend to drive at night more when the roads are often clear. So I am not looking for a track set-up either. I just want the best for driving it in my normal use. Yep, that is the fun of driving a Murena. When I bought the car it was driving like a wet newspaper. It was unpredictable in any aspect. From that moment on I am busy to get the driving experience better. I started to replace most rubber in the rear and front, and overhauled the steering rack and replaced all rods and ball-joints. Lining the car learned that the right rear wheel was 7 mm out of specs. The cause was a bad welding job on the right rear arm, so i replaced that with a better one. Then i changed tires.....Back to the start. I have the feeling making progress again with the conti's on the front and the new spax on the rear. This summer I am playing around with setting it up. Anyone got experience with Falken tires ? Their "ZIEX ZE-512" tire comes in both 186/60R14 and 195/60R14, but only "H" rated. Well, well. Seems like it is easier this year. Dunlop makes the "Direzza Sport Z1" in both 186/60R14 and 195/60R14 sizes. Still only "H" rated. Anyone got experience with them? Here is a test for the Dunlops and other tires compared with the Michelin PS2 that is proofed good on a Murena. They do very good in the test. Wow, that is a good review for these tires, both dry and wet. I have sent out a couple of queries to find out how much they will cost delivered to Copenhagen, Denmark. I did find them in a US shop for $108 each, which is not too bad. I may get a set to have on hand when I get tired of the PremiumContact2 tires. And most suprising is the 2nd place for the Hankook tires.